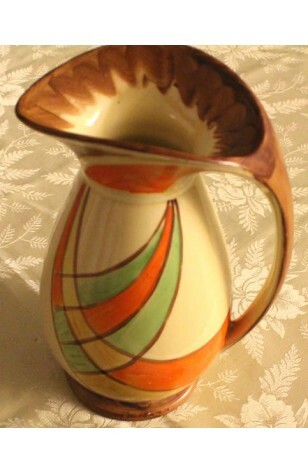 Vintage - Myott Pottery, Art Deco, Large Signed "Dante" Jug, Pattern #9811, Circa 1930's. A Very Bright and Colorful, Vintage "Daunte" Jug or Pitcher, stands 8 1/2" Tall, and Signed on the Base, Made by Myott & B.A.G. Co. (British American Glass) in the 1930's. This beautifully Hand Painted Jug is also affectionately called "Chicken Neck Jug". Designed in a very Bright Geometric Pattern of Orange, Yellow and Green on a Brown Curvy Grid... All of which is on a Background of Beige. This Jug is in Excellent Condition, and a truly Rare item in this size.